in the winter when it’s freezing outside, i am always craving a spicy pot of chili or a hot bowl of hearty soup. with the weather and as cold as it has been lately, i prolly don’t have to tell you just how much soup we’ve been eating lately. (this texan is pretty annoyed with how cold it is – UM IT WAS 9 DEGREES THIS MORNING – and the fact that is hasn’t even snowed yet. i mean if it’s going to be this cold, we should at least get to go out and play in it! but i digress…) honestly, i am truly loving the stay-in-and-get-cozy-and-consume-lots-of-chili weather.. and my budget conscious husband is too, because the leftovers carry us for multiple days after. of course in order to properly consume said chili or soup one must, MUST, have a bread or toast or biscuit to go on the side. (it’s just wrong not to.) my husband’s m.o. is to crumble or tear up the bread or biscuit and mix it into the soup or stew. these biscuits have become our favorite side for winter meals. they are the perfect cheddar biscuit.. fluffy yet perfectly dense, the pepper maybe being my favorite part. they keep well for about 4-5 days, sealed in an airtight container. preheat oven to 400. in a large bowl combine dry ingredients and whisk to incorporate. add cold butter and, using a pastry cutter or your fingers, cut in until a fine meal forms. mix in grated cheese. add buttermilk to bind the dough. turn out on to a floured surface and fully combine dough. pat out to about 3/4″ thickness. using a cookie cutter (i used a 3″ square), cut out the biscuits and place on a large, ungreased cookie sheet. in a small bowl, whisk together the egg and milk. brush mixture over the tops of the biscuits. bake until golden brown and firm to the touch, about 16-18 minutes. these days, life is a little crazy. we have two little ones and a very busy schedule. somehow we, well i, got away from one of my dearest loves: entertaining/taking care of people in our home. the house is often a mess and i get stressed over the day and sometimes it’s just too much to handle making dinner and trying to clean the place. all that said, i am working on it. we are making plans and inviting people over to watch basketball games, tidying up as best we can while still knowing a little mess IS OKAY – a daily reminder of one of my favorite mantras, present over perfect (thanks to my friend shauna, who encourages so many with this quote + chapter from the lovely bread & wine). and it sure makes it easy when i have something yummy ready in the kitchen that i am dying to share with someone. this recipe is one of those things. although i could have easily taken it out of the oven, grabbed a bag of tortilla chips, walked back to my bedroom, locked the door, and eaten the entire thing all by mineself. and then licked the bowl wholeheartedly. 1. to make the vinaigrette, combine the chiles, vinegar, garlic, agave, and oil, plus a good sized pinch of the cilantro in a blender and puree until smooth. season with salt & pepper. 2. to make the queso: melt the butter in a medium saucepan over medium heat. add the flour and cook, constantly whisking, about 1 minute. add the milk and cook, constantly whisking, until slightly thickened, about 3-5 minutes. remove from heat and whisk in monterey jack, one handful at a time (don’t add the next handful until cheese has completely melted). add a scant 1/4 tsp salt, and a bit of pepper to taste. 3. turn on the broiler. scrape the melted cheese mixture into an 8 inch baking dish. scatter the crumbled goat cheese over the top, covering evenly. broil until golden brown in spots, about 5-7 minutes. remove from the oven and let it sit for 5-10 minutes, to allow the cheese to set. drizzle the vinaigrette over the top* and sprinkle with chopped cilantro. serve warm with tortilla chips. *i drizzled about 1/2 of the vinaigrette just after it came out of the oven. as we ate, i drizzled more on top. of course, during our first year of marriage i had to pull out something big. something serious. something really fancy and high class. burrito pie was it. i mean, what sounds more country club than BURRITO PIE?? i’m pretty sure they serve it at state dinners and probably at buckingham palace for christmas. all joking aside, i knew no matter what i made, it had to be fairly simple for my new husband who was (and still is) purely a meat-and-potatoes guy. if i had made him something truly out-of-the-box different, he would have walked out the door, driven to taco bell (actually it would have been bojangles – bless it – since we lived in north carolina), ordered himself a meal, and brought it back home. so it has only taken me 2 years of blogging to finally share this with you, my oldest, most-used, most-asked for recipe. it is super easy and the ingredients are simple. it is a comfort dish, perfect for cold days or lazy weekends around the house. it’s also a good one to take to people who have just had a baby or are just needing a little help with dinner. 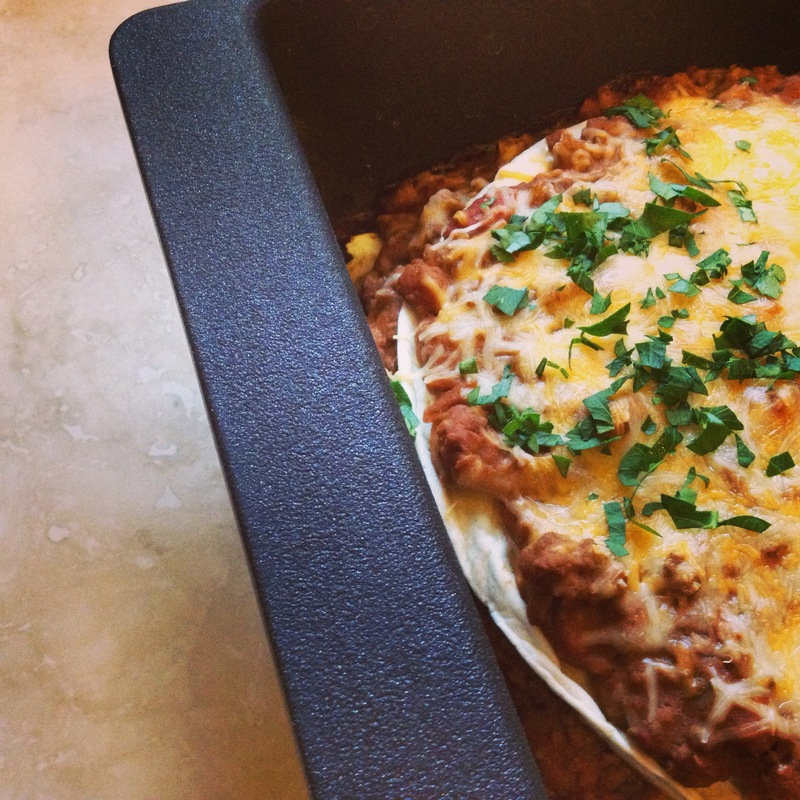 it has been dubbed “the famous burrito pie” thanks to the lovely lady who posted my recipe inspiration on allrecipes.com back in 2002 – i am forever grateful. 2. in a large skillet, brown the ground beef over high heat. when meat is almost no longer pink, add the chopped onion and cook until onion is translucent and fat has cooked off (or you can drain, if desired). add garlic and cook another 45 seconds or so. mix in the beans and stir to soften & combine. add the rotel, taco sauce, and olives (if using). stir mixture well, making sure everything is incorporated. reduce heat to low and simmer, uncovered, for 15-20 minutes. stir occasionally. take mixture off heat. 3. spread a thin layer of the meat mixture on the bottom of an ungreased large casserole dish. tear each tortilla in half (to get better coverage) and make a layer of tortillas on top of the meat mixture. follow with another layer of meat mixture, then a layer of cheese. repeat tortilla, meat, cheese pattern until all the meat mixture is used, ending with a layer of meat mixture then cheese. 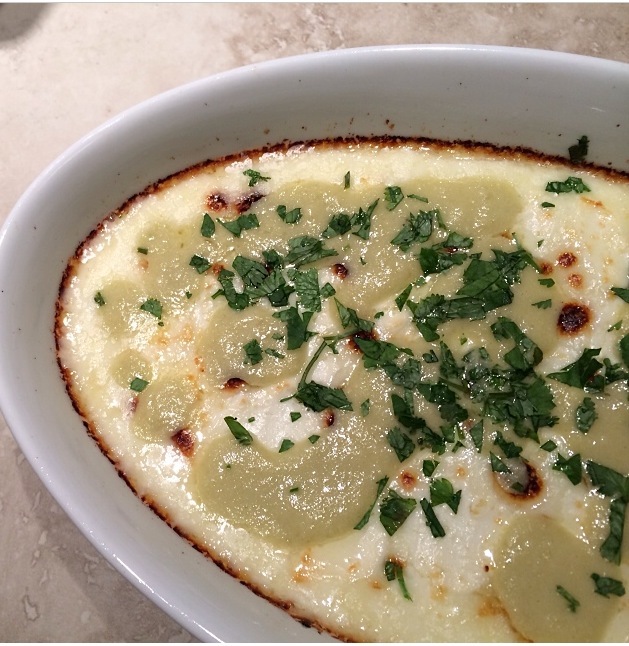 4. bake for 18-20 minutes, until it’s cooked through and the the cheese is bubbly. top each serving with salsa, cholula, and sour cream and serve hot. *any ingredient with a star by it is also available in a hot or spicy version.. if you are wanting SPICY, go for the hot versions. whenever i throw a birthday party, it seems like we always do a brunch. maybe because i personally think it’s the best time to have a party when you’ll have kiddos running around. it’s after breakfast, before naptime, everyone is awake, snacktime is approaching.. it’s THE perfect time of day for a party. or maybe it’s because breakfast foods are my absolute favorite. honestly, if i could have breakfast for every meal of the day, i would be a happy girl. 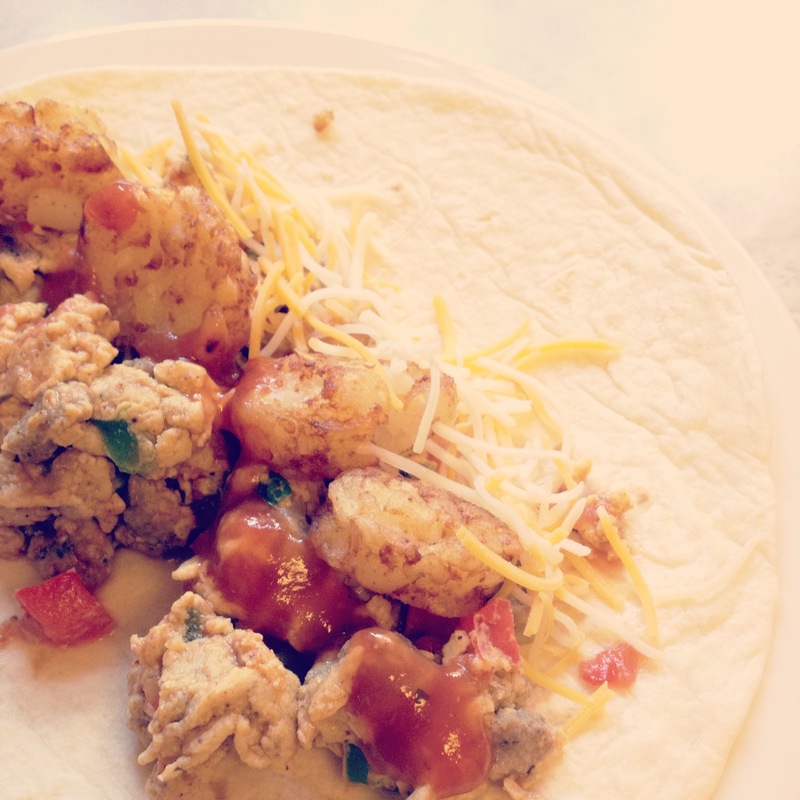 these breakfast burritos are nearly always on the menu for our brunch parties. they are hearty and the recipe feeds a lot of people. i have had this recipe for years and adapted it & changed it, making it differently almost every time. it is a great recipe that you can make your own, adding or omitting depending on your preferences. the original recipe calls for chorizo, which i love, but when i have guests who don’t love it, i like to sub turkey sausage. you can also turn up the heat with spicy sausage or leave the seeds in from the jalapeños if you want it spicy. 1. cook potatoes/hashbrowns according to package directions. once cooked, crumble & keep warm. 2. in a large bowl, whisk eggs, chili powder, garlic salt, and cumin. set aside. 3. in a large skillet over medium-high heat, cook chorizo or sausage, bell peppers, jalapeños, and green onions until meat is no longer pink** (drain if desired). add egg mixture. while stirring constantly, cook over medium-high heat until eggs are set. stir in salsa. 4. spoon about 1/3 cup hashbrowns and about 1/2 cup egg mixture into each tortilla, sprinkle with cheese (and more salsa if desired). to freeze/save for later: wrap each prepared burrito in wax paper, then in foil. let cool to room temperature, then freeze for up to 1 month. to reheat: remove foil & wax paper. place burritos about 2 inches apart on an ungreased baking sheet. bake, uncovered, at 350 for about 50 minutes. *the original recipe calls for hashbrowns, but i find that these take too long to cook and they are always a little bit of drama for me. i prefer to use either tater tots or the “crispy crowns” – they are delicious and super easy to bake in the oven. 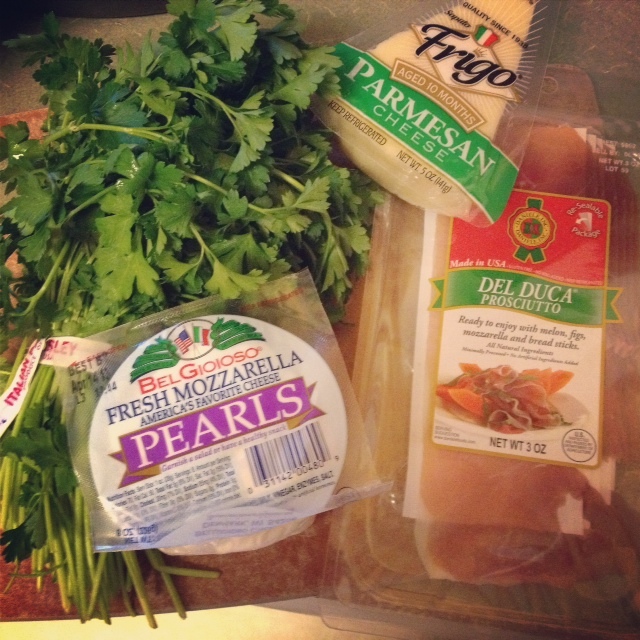 **you can use 10 oz of chorizo, turkey sausage, spicy pork sausage – whatever your preference. also, you can use cooked instead of uncooked. this cuts down on prep time a bit. just follow the same directions in order to warm up the meat and cook the peppers & onions. mornings can be tough, yo. especially when you are rushing around and really getting tired of eggs and toast every. single. morning. we all need a little excitement, and that excitement in my house, has to be kid-friendly. these not-really-a-muffin muffins are all of the above. so delicious, kids love ’em, and they’ve been a hit each time i have made them. oh, and they are super super easy. this recipe makes quite a few muffins so they are perfect for brunch parties. (you can 1/2 the recipe for a quieter morning at home.) also, they are really easy to modify. you can add chopped & sautéed spinach, use diced ham instead of turkey sausage, use goat or feta cheese instead of cheddar, add some cholula for some heat, make them meatless… the possibilities are nearly endless. *to make these whole30 friendly, just omit the milk and cheddar cheese. 1. preheat the oven to 350. spray two 12-cup muffin tins generously with cooking spray. 2. in a large bowl, beat the eggs. whisk in the milk, garlic salt, & pepper. stir in 3/4 of the cheese, the bell pepper and sausage. 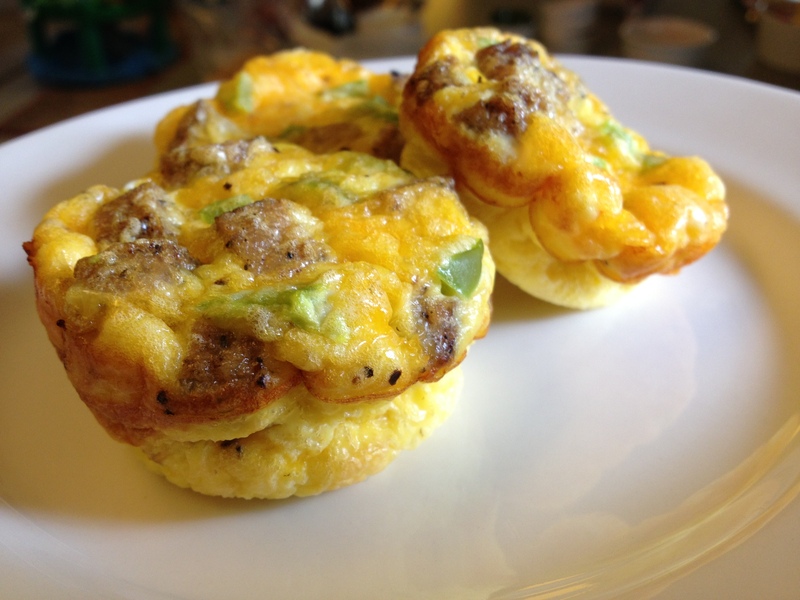 scoop egg mixture into muffin tin (fill about 1/2 full – they puff up quite a bit). sprinkle the rest of the cheese over tops of muffins. bake for 20-25 minutes or until a toothpick or knife inserted into the center comes out clean and they’ve begun to golden a little around the edges. muffins will keep for a few days in the fridge, sealed well. just reheat for 10-15 seconds in the microwave. arancini is a masterpiece of italian cooking, and is one of those divine things we get to experience in life on earth. in italian, arancini means “little oranges”. they are small fried balls of oozy, cheesy risotto with a gorgeous, crispy outside. as glorious as they may be, they are a rare thing i will not make in my own kitchen. i don’t really fry anything and these babies take a LOT of time & effort to make. so whenever i am at an italian restaurant that makes arancini for me, i order them as fast as i can. my gift to you: easy arancini deliciousness that you can whip up on a regular weeknight. AND you don’t have to boil the pasta! it’s especially kid-friendly and with the addition of the salty pancetta, it was a big pleaser for the man in my house. with your fork, you gently crack open the crunchy panko topping and it gives way to the beautiful, stringy mozzarella cheese hiding underneath. try not to eat the entire dish. 1. preheat oven to 400 degrees. melt 4 tbsp butter in a large (2 quart) saucepan over medium-high heat. add flour, whisking constantly for about 1 minute. add milk & water, whisking to scrape all flour-butter mixture off the bottom of the pan. bring to a boil, then reduce heat to low. add salt and pepper. simmer until mixture begins to thicken a bit, about 10 minutes. remove from heat. 2. meanwhile, in a small skillet, crisp the pancetta over medium heat until nicely browned. 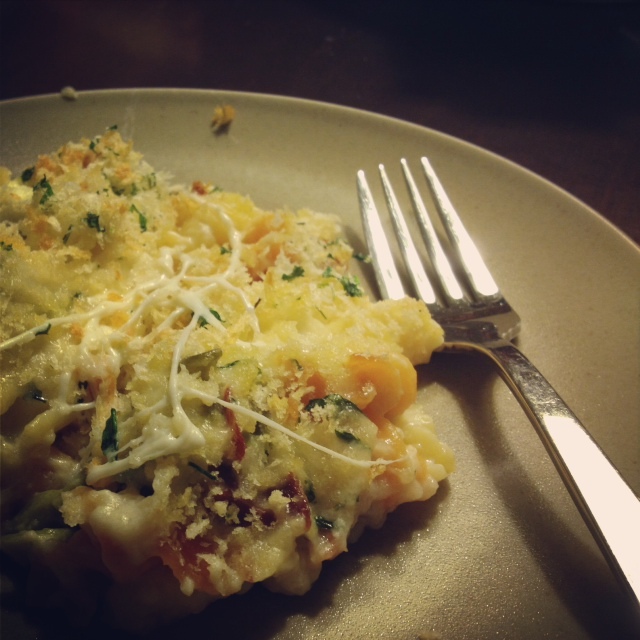 pour uncooked macaroni pasta into an ungreased 9×13 baking dish, and grate parmesan cheese evenly over the top. once the pancetta is done, sprinkle on top of pasta & parmesan. add remaining 3 tbsp of butter to pancetta pan and melt over low heat. place panko in a medium-sized mixing bowl & pour melted butter over top, and add in chopped parsley. using your fingers, mix to combine. season with just a pinch of salt & pepper. 3. pour milk mixture over pasta in baking dish (it will feel like a lot of liquid, but it will be fine – this cooks the pasta). cover dish with foil and carefully transfer to the oven. bake for 20 minutes. 4. remove from oven, uncover, and gently stir. scatter mozzarella evenly over the top of the mixture. top with panko mixture. bake for 15-20 minutes more – uncovered – until top is golden brown and macaroni is bubbling. let dish sit for about 10 minutes to cool before serving. my maternal grandparents used to live in london, and every thanksgiving when they weren’t able to go back to the states they would travel up to scotland with all of their expat buddies and stay at a manor called dalreach house (pronounced dal-reek). they would enjoy the holiday amongst other texans, drinking scotch, eating too much, and illegally fishing for salmon in the river. and the dalreach house sandwich was born. it’s made on sturdy toasty bread, with lots of melty cheese, hunks of leftover turkey, crispy bacon, and topped with as many jalapeños as you can handle. this is honestly the only holiday recipe i look forward to all year long. i hope your family loves it as much as the chapmans and the barbers (and now the todds) do! 1. set the oven to broil, at about 500. take all of your bread slices (one slice for each sandwich) and lightly toast them, either in the oven on broil or in your toaster. 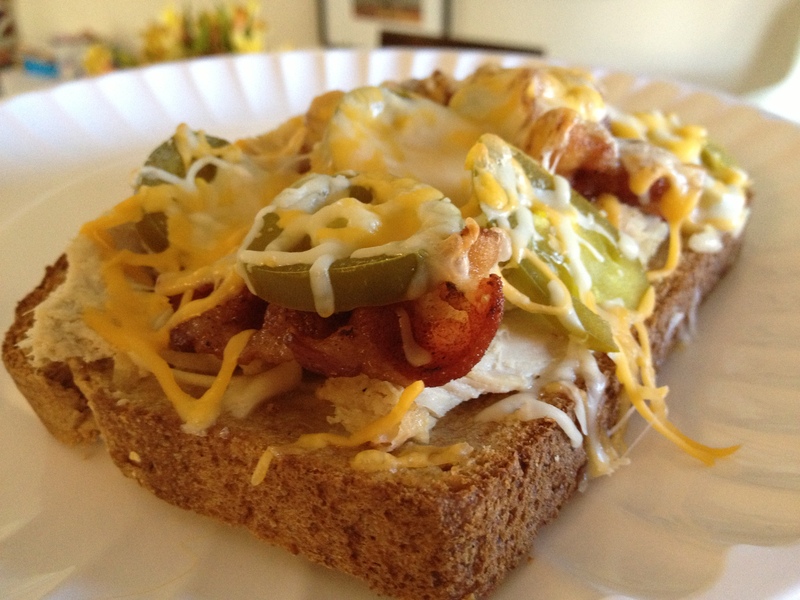 2. for each open-faced sandwich: spread mayo on one slice of bread (this depends on how much mayo each person likes). then top with thickly sliced turkey and 2-3 strips of bacon, then cover with shredded cheese. top with jalapeños as desired (for me or my mom, it’s LOTS). have a very happy thanksgiving and enjoy lots of these on the day after!